Sometimes a normal MPV just isn't big enough, and in those cases something more like the Tourneo Custom is required. With eight adult-sized seats as standard; a number that can be customised via the options list, plus a very large luggage space with all seats in place, little else has quite the same practicality as a long-wheelbase Tourneo. Built to steal sales not just from the current airport taxi options, but to also attack the executive travel market and a host of seating configurations, style treatments and upmarket technologies will ultimately be available. This long-wheelbase version adds a significant 37cm extra to the length of the car, all of which is used here as luggage space. Previous versions of Transit van-derived people movers have been functional, but this one now seeks to add enough style to compete with the likes of Mercedes and Volkswagen, who are both established players with their Vito and Transporter. It has a more car-like ambiance than ever, although its sheer height and weight prevents a similarly car-like driving experience. The Tourneo Custom Limited is the most upmarket option available on the platform at launch, and as such comes with a certain plushness that the similar but more utilitarian Kombi model lacks. The Limited is biased more towards permanent people-moving whereas the Kombi is much cheaper and less well appointed to fit with its half people-carrier, half van status. Bearing in mind that the target buyer for the Tourneo Custom is a business user, emissions are important for tax reasons and the ageing 2.2-litre diesel engine has been thoroughly reworked to achieve a set of very impressive emissions figures. Even this, as the most powerful choice, represents an affordable proposition if the purchase price has no special bearing. Different models of the Tourneo can feel very different to drive, but while those with higher payload capabilities have better ride quality and stability, it's the high-end long wheelbase versions like this that have the biggest potential to make inroads into Ford's target market sectors. The available space is extremely impressive and with many useful features to boast of, the Tourneo is a worthy competitor for the Vito and Transporter. Ownership costs are key in this sector, and the Tourneo does well with a low-power engine offering that dips to very appealing levels. Even this, the highest power version of the engine, achieves reasonable running costs. Miles per gallon can be boosted with the use of an acceleration-limiting device that can secure big savings at the pump while ensuring that acceleration stays constant even when the Tourneo is fully loaded. Thanks to the extra 37cm of length the long wheelbase Tourneo can carry up to nine as well as a huge amount of luggage stacked behind the rear seats. Under normal circumstances there is little chance that it wouldn't be big enough to carry a large holiday-going party and their luggage to the airport, for example. The font of the cabin is also very practical, with two 12-volt power sockets, an optional power converter for standard 230-volt three-pin plug devices and lots of convenient storage. Although most of the Tourneo Custom's controls are pleasantly chunky and feel built to last, their positioning sometimes leaves something to be desired. The heating controls, for example, are positioned to the left of the gear stick, putting them beyond casual reach and forcing the driver to lean over to adjust the air flow and temperature. The main instrument cluster is attractive and clear, but the satellite navigation system readout looks dated. Outright comfort depends largely on the Tourneo's payload rating, because the higher that is, the better it seems to ride. Where low-payload versions allow more vibrations and harsh knocks to transmit through the cabin, the high-payload options are more settled and composed. There is no shortage of legroom in any of the seats, though, and with a good balance in terms of the amount of seat padding the Tourneo is good for long journeys. A twin front passenger seat is optional but comfort is still ample. Only the Limited model comes with an alarm as standard, but even then it only works on the car's perimeter and not the inside as well. The load bay is not secure as there is no barrier between the easily foldable rear seats and any on-board luggage. There is a covered storage bin above the main instrument cluster, though, and the large lower front door pockets are completely out of sight when the doors are closed. An immobiliser is standard fit. 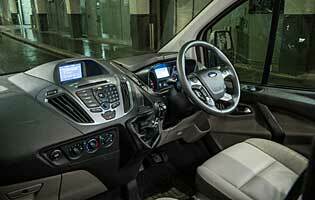 Ford has taken safety very seriously here, with advanced active technologies on guard to help avoid accidents. A comprehensive array of airbags is also standard on this model. Stability control, Trailer Sway Control and roll-over mitigation are linked into one system along with Load Adaptive Control, which adjusts the responses of the ESP proportionately when it senses that the vehicle is loaded. Hill Start Assist is also available to stop the van rolling backwards during hill starts. Ford claims 'more car-like handling' than before, but the truth is that no vehicle of this size and weight can really feel like a car, especially when fitted with a van's slow steering rack that needs to be turned for what seems like an age to go from fully left to fully right. However, versions with higher payloads, notably the 310 and up, have stronger suspension components and ride better. This long wheelbase model is a little jittery, and over rough surfaces a little flex is evident. 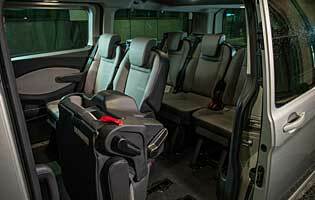 Families will find much to love with the Tourneo. 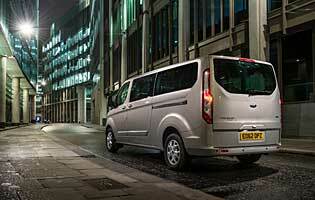 With eight seats as standard it can hold all but the largest of families, and an extra seat is an option if necessary. The luggage-carrying capacity of this model is overwhelming even compared to the biggest of traditional seven-seat people-carriers, so whatever the load, be it bikes, toys or even a wheelchair, the long wheelbase Tourneo can handle it with ease. The boot area carpet is potentially vulnerable to damage, though. There is little reasoning to be found anywhere to support the idea that the Tourneo Custom would be either desirable as a first car or a good idea if all financial and legal hurdles were surmountable. Its size, especially in this longer version, can be remarkably intimidating even for seasoned drivers, so the vehicle could be a liability in inexperienced hands. Furthermore, the purchase price of what amounts to a range-topping model is astronomical in the eyes of a first-time buyer's budget. 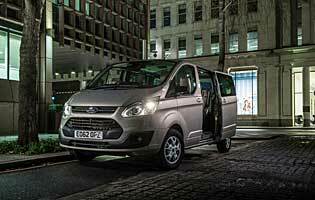 Perceived quality is the main area Ford wanted to improve on from the last model as the Tourneo Custom sets its sights on the more established rivals in the up-to-nine-seat van-derived people carrier class. And it is a big boost from its prior incarnation, with plush carpets underpinning substantial materials and an overall tight feeling. The looks of the centre console are less classy than its rivals, though, which does affect how prestige it can realistically feel. Vehicles this tall can have the reverse issue of that faced by most cars. Where occupants effectively have to duck and drop into most cars the Tourneo's cabin requires a step up. But thanks to the relatively high roof the overall process is much easier and more comfortable than many cars. The only things counting against it are somewhat heavy doors that take a firm push or pull to move, and the large tailgate that needs a lot of space in which to open. With rather a large console to fill, Ford has decided to place lots of chunky buttons in the centre, underneath a recessed colour screen. The chunkiness of the buttons works in the layout's favour, with big buttons letting occupants select CD, navigation and auxiliary input modes. However, some of the controls are on the side of the console furthest away from the driver, which can make using them more awkward - particularly while driving. The Tourneo has a carefully selected choice of colours that give potential buyers the ability to buy in a colour that suits them and their business - or just their personal preference. Subtle colours like silver look best on the stylish people-mover's lines, but the red option is good too. The interior trim is a big step up in quality from the previous generation and looks plush, with this model showing a higher emphasis on luxury and quality. The Limited model has rear parking sensors as standard, which makes a huge difference to how easy the vehicle is to park. At over five metres in length the long wheelbase model's size can be quite difficult to judge when manoeuvring at low speed, so all help is appreciated. That length rules it out of tighter car parks, and it also makes finding a suitable space much harder, whether it's a bay or a roadside space. Its turning circle is excellent, though. Full size spare wheel fitted as standard. Diesel engine options – 2.2-litre (99bhp, 123bhp, 153bhp). Transmission options: six-speed manual gearbox only. Trim levels: Tourneo Custom, Trend, Limited.